Recycling. It’s good for our climate, good for our campus, and good for our world! At Wellesley, we are all about finding ways to change the world (in between classes and orgs, and eating, and breathing, of course). In 2017–2018 we collected about 141 tons of recyclable materials, including paper, plastic, and cans. That means 141 tons of stuff was recycled that would have otherwise been sent to an incinerator. We get that you have a lot going on, but here’s one simple way to ease your stress about your carbon footprint...because we can all do better. Now, the Office of Sustainability is helping you* help Wellesley increase that number (and reduce your trips to the recycling bins). * This is a pilot program for all first-years and Caz residents to see if the bags will increase our recycling rate. 2. Walk the bag down the hall when it is full. Separate paper and plastics. And do it properly! 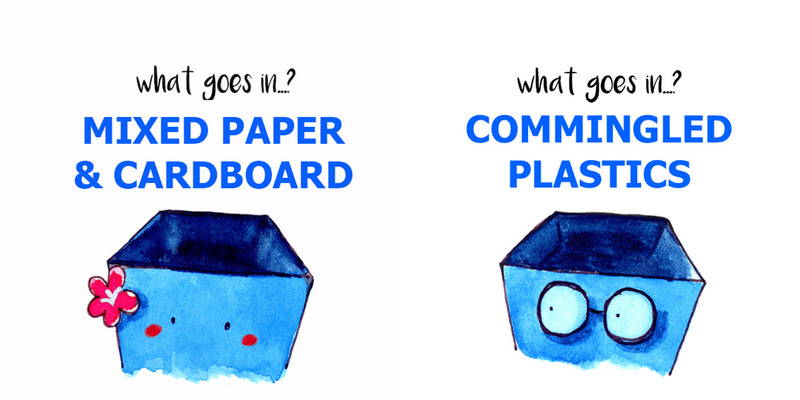 We have a dual-stream system, which means paper and plastics need to be separated. Nicole Zhao ’20 designed the bags. She won a Camellia Student Leadership Award for her work in recycling graphics and on-campus campaigns. This sustainability pilot program is brought to you by the class of 1957. Leave it to a green class to spark a green initiative that will have an impact on Wellesley students for generations.